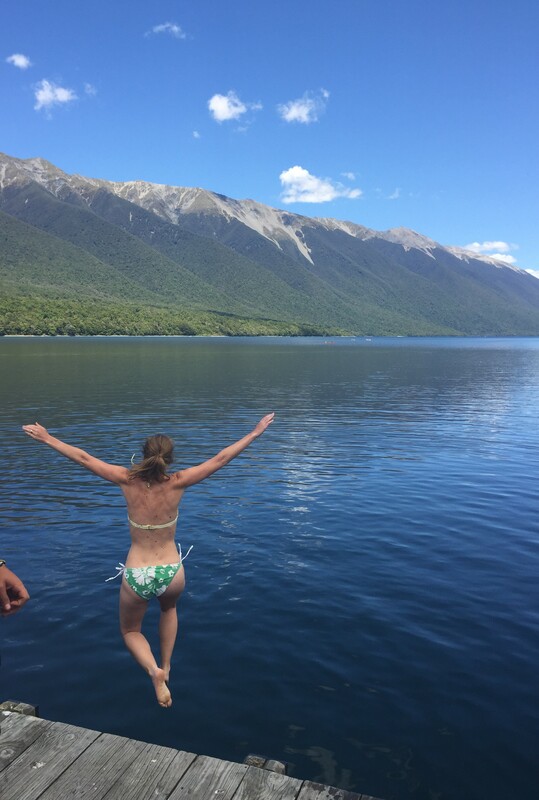 During the Christmas holidays we took a two week KiwiExperience bus trip around the South Island. Over 15 days we slept in 9 towns and visited many more. I have divided the trip into 3 sections. This is the first: Nelson, Kaiteriteri, Westport, & Hokitika. Allen and I arrived in Nelson on a beautiful, sunny day. We grabbed our luggage from outside the miniature airport and moved it all of 15 feet to a waiting cab. We dropped our bags at the YHA and embarked on Nelson’s craft beer trail: walking and sipping our way through town. A great way to spend the day! The following morning we strolled along the water to Tahunanui Beach. Driving past it later at low tide the size of the beach quadrupled and sand was visible where people had previously been jumping from the pier. The difference was massive! Nelson was the starting point for our KiwiExperience adventure and it was time to leave all too soon. Shortly after we hopped on the bus our driver advised us there were limited dining options at our destination and brought us to a grocery store. 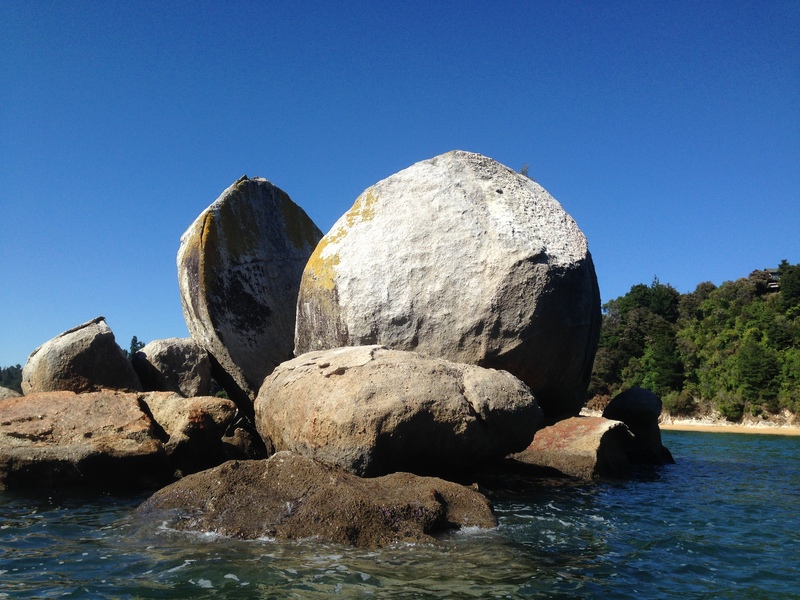 Located a few kilometres from Abel Tasman National Park, Kaiteriteri is the place to organize your excursions within the park. We signed up for a kayaking trip the next day and headed to the beach to complete a coastal/bush walk between Kaiteriteri and Little Kaiteriteri beaches. The sun was shining the following day as we launched our double kayaks and paddled over smooth water from Marahau to Kaiteriteri. We did not see seals, but passed the famous split apple rock. Back on the bus I did the obligatory wharf jump into Nelson Lakes. Through the crystal clear water I could see eels swimming under the dock as I debated my plunge. Westport was a quiet town with a surprising number of activities: jet boating, horse trekking, beach bonfires, etc. unfortunately the horseback ride was not available at my chosen time, but Allen enjoyed a 3-hour surf lesson. We spent an extra day in Westport in order to attend Christmas mass. We sang carols and celebrated a joyful service at St. Canice. Originally I had not wanted to travel on Christmas, but it ended up being my favourite day on the road! First we visited Cape Foulwind Seal Colony and coastal walk. I could have spent hours watching the active seals if I was not afraid of missing the bus. 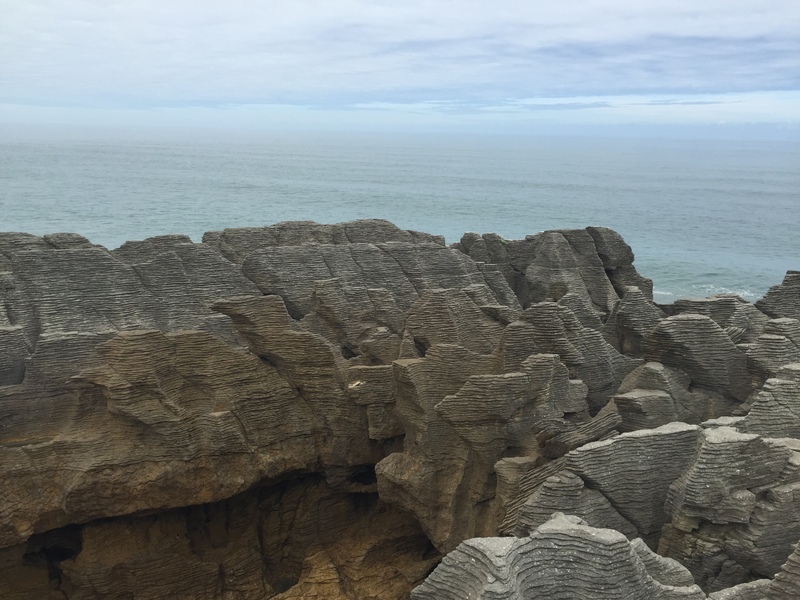 Next we arrived at Pancake Rocks in Punakaiki. I had seen their image on Kiwi stamps, but in reality they are incredible! These limestone creations began forming 30 million years ago. A composite of lime-rich marine creatures, clay, and mud, they create the image of individual layers – or pancakes – stacked on top of one another. For Christmas we treated ourselves to a beachfront room at the aptly named Hokitika Beachfront Hotel. I was pleasantly surprised by the variety of activities available despite the public holiday. The glow worm dell just off the highway was impressive, and local laws permitted us to build a driftwood bonfire on the beach. Hokitika was a restful time where we relished the privacy of a hotel room and appreciated the beautiful surroundings. Sprig & Fern Hardy Street – live music in small courtyard. stayed at YHA Nelson – small double room; clean facilities; close to shops and restaurants; $25-$30 cab from airport. Kaying with Kahu Kayaks was good, not great. I was disappointed in very little commentary provided. The tour also seemed rushed, but we finished an hour early so would have preferred to take our time. stayed in a dorm room at Kaiteriteri Lodge. Room 5 was great, but heard others were not. brought food to eat in hostel since there were limited dining option. Jumped in Nelson Lakes which is full of eels! Coastal walk to Cape Foulwind Seal Colony. Self-catered at hostel from New World; dinner at Town House on Christmas Eve was disappointing. Treated ourselves to Hokitika Beachfront Hotel with a lanai and beach view! Sunny and 70s for the first couple days, then overcast. Windy on the peninsula at the end of the beach.